I recently purchased a subscription to Microsoft 365 Office Home Premium for AUD12 per month. And I just received my first invoice. It came by traditional snail-mail from Singapore to Australia. I can't even begin to grasp the level of management dysfunction that allows a tech giant to put a piece of dead tree through a printing press, into an envelope and onto a jet plane every month to give an unwanted receipt for an amount equal to three coffees. This is more than a decade after Bill Gates said that the internet was central to everything that they were going to do. But at least they have got some economies of scale by using regional offices. Just think how much more it would have cost them if every country did their own invoicing. I have an AmEx card issued by AmEx UK, billed in Sterling. The monthly paper statements are airmailed from the USA. They are probably invoicing from Singapore so they can avoid Australian income tax on the profits from the sale to you. Based on your previous posts about Linux, VDI, "Software will Eat the World" etc., I didn't pick you for a proprietary office suite type of guy. LibreOffice and / or Google Docs not cutting it? Need the Excel functions for modeling? Yes. Microsoft: Orphan in the Sky. Need MSFT for a computer at home shared with my wife. Also need MS Access sometimes for legacy code. The latter annoys me witless as it prohibits Macs on which Access will not run. Msft - the dumbest, smartest fuckers in all of tech. I think the commenter above has it right. I'm sure it's all a complicated tax avoidance scheme that then must follow local billing and tax laws. Look at the how much of their 'production' is assigned to Puerto Rico for a sense of how they structure things. 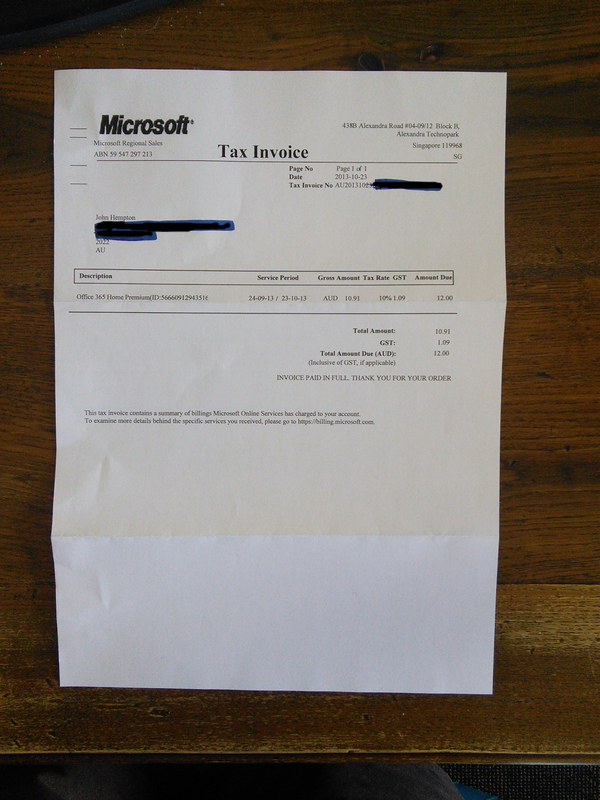 Not to defend MIcrosoft, but I bet this is more regulatory/tax arbitrage than a case of idiots running the show. I managed to forget the password for my Office 365 web site. The password reset option tells me that they can't contact me via my phone, and I should contact my admin (me). Or call support (with a blue link which doesn't work). This is on par with the snail mail I received (in NYC) a couple of years ago from the FT (via a Netherlands office)informing me that I could use my online subscription with their new web app. you're paying them 144 AUD per annum indefinitely . . . they must be doing something right. For your legacy code issue, obviously I don't know what you have, but it may be easier than you think to retrofit an open-source SQL database. MySQL on my MacBook has been liberating. This sort of adaptation can be hired out to the former Eastern Bloc for pennies on the dollar, using sites like Rentacoder, Guru, Elance, etc. Google sent me a piece of snail mail the other day. You might like to consider shorting that as well. Do I detect some bitterness? Doesn't snail mail presume more about the average customer than say something about the sender?